Today, 258 million people are international migrants, living outside their country of birth. They make important contributions to both their host and home countries. For example, in 2017 alone, they sent an estimated $466 billion in remittances to low- and middle-income countries. 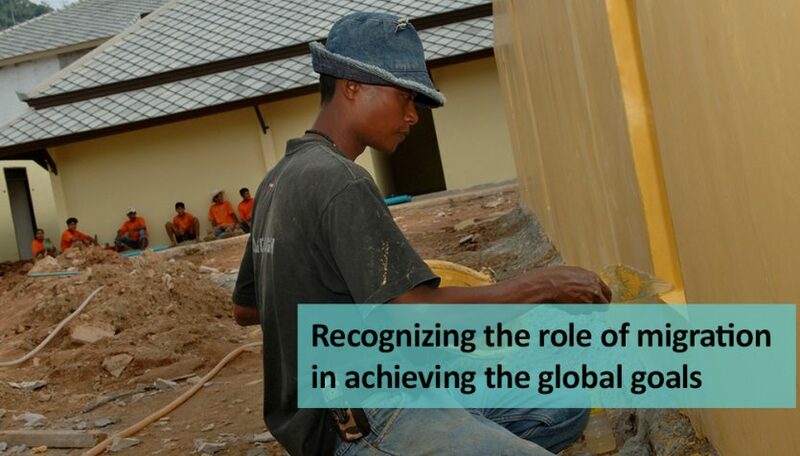 International migration makes a critical contribution to sustainable development by raising the productivity of migrant workers and thus increasing the global economic output. In many situations, it also helps to narrow inequalities, reduce vulnerabilities and alleviate the demographic impact of population ageing. On the heels of the recent intergovernmental conference in Marrakech last December, the Population Division of UN DESA will convene researchers and other experts for a one-day symposium on 26 February 2019, to review evidence on interrelations between international migration and development. Taking place at UN Headquarters in New York, the symposium is being organized in lieu of the annual coordination meeting on international migration, in close coordination with the Office of the President of the General Assembly, the International Organization for Migration (IOM) and the United Nations Network on Migration. The symposium will highlight opportunities for addressing issues related to migration and development during the high-level political forum on sustainable development taking place in July and September 2019, as well as ways and means of improving the collection and use of migration data in the context of the 2030 Agenda for Sustainable Development and the Global Compact for Safe, Orderly and Regular Migration. It will also promote the sharing of information on recent initiatives on international migration and development. By bringing together experts on international migration from the United Nations system, other intergovernmental organizations, national governments, civil society, academia and the private sector, the expert symposium will offer an opportunity to advance the global discussion and to share practical information about ongoing and anticipated activities on migration and related topics. The event also aims at exploring ways to strengthen the evidence base on international migration, which is crucial for developing and implementing sound policies, dispelling myths and countering xenophobia. The expert symposium will contribute to the High-Level Debate on International Migration and Development to be convened by the President of the General Assembly on Wednesday, 27 February 2019, which will focus on the role of migration in the Sustainable Development Goals (SDGs), which will be reviewed by the High-level Political Forum on Sustainable Development in July 2019. On 28 February 2019, IOM will hold this year’s first session of the International Dialogue on Migration under the theme “Youth and migration: Engaging youth as key partners in migration governance”, bringing the voices of young migrants and agents of change into the global debate on migration. Hooked on carbon – how can we break the habit? UN DESA’s latest World Economic Situation and Prospects (WESP) report could not be any clearer: the global transition to cleaner energy is not happening fast enough. After three years of remaining flat, energy-related carbon emissions picked up again in 2017, reaching a new historic high, and preliminary evidence suggests that this worrisome record will be crushed again for 2018. This increase in emissions coincides with robust growth in global GDP – a sure sign that, despite progress on renewable energy sources, the world economy is still very much carbon-dependent. This spells trouble not only for the climate and the environment, but for every aspect of our lives, including the global economy. The 2019 WESP report warns that climate change, which used to be a long-term economic risk, has now become a very real and direct threat to economic activity and to the livelihoods of millions of people. According to Munich Re’s NatCatSERVICE, the number of weather-related loss events has more than tripled since the 1980s, and 2017 ranked among the top five years with most natural catastrophes. That same year, natural events caused losses estimated at a whopping $335 billion and, according to the Internal Displacement Monitoring Centre, displaced 18 million people in 135 countries. Extreme weather continued in 2018, leaving more than 10,000 deaths in its wake. Things are likely to get worse, warns the recent Intergovernmental Panel on Climate Change (IPCC) report, unless we reduce our carbon pollution by 45 per cent by 2030 and bring it down to ‘net zero’ by 2050. We can only achieve such dramatic reductions if we decouple our economic growth from carbon emissions or, in other words, if we end our economy’s addiction to fossil fuels. One way to facilitate the required technological and economic transformation is to put a price on carbon pollution. This can be achieved through measures such as emissions taxes or emissions rights trading mechanisms. Fair and equitable carbon pricing would create an incentive for developing innovative low-carbon technologies and generate an additional source of revenue. Governments could redistribute that revenue as social transfers to ease the transition to the low-carbon economy. Carbon pricing could also help to pay for low-emissions technology and infrastructure and incentivize natural climate solutions, such as reforestation, land-use change and other ecosystem-based approaches. These measures could accelerate efforts towards economic diversification in countries that remain highly reliant on fossil-fuel production. 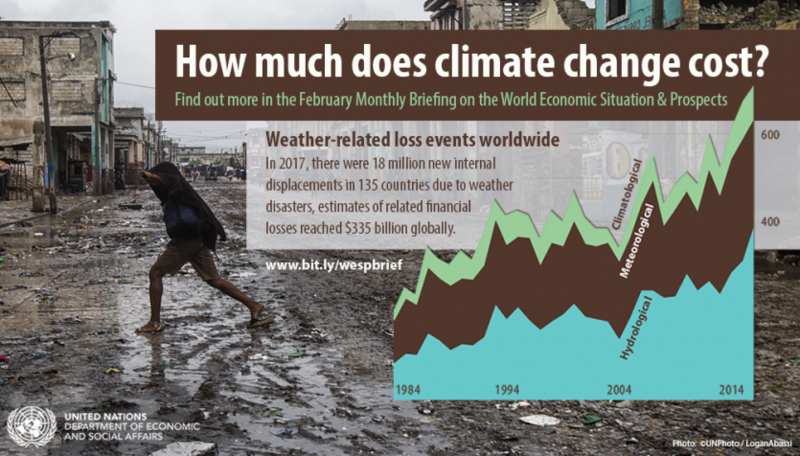 To learn more about the effects of climate change and its policy challenges, read the February issue of UN DESA’s World Economic Situation and Prospects Monthly Briefing. Every month, the WESP Monthly Briefing brings you the latest and most relevant information on global economy. Stay tuned!